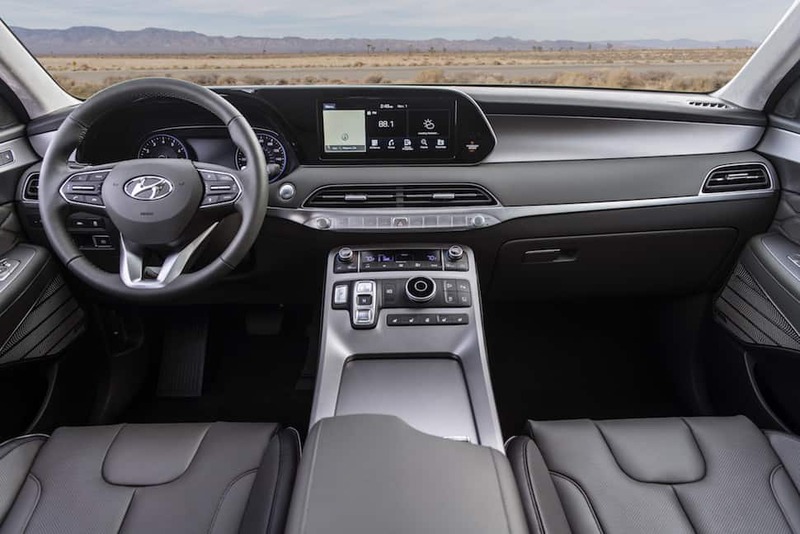 Los Angeles, California – With six SUVs in the lineup now, the full-size Palisade just announced and, according to Hyundai America chief operating officer Brian Smith, another on the way, is Hyundai transitioning from a car company that makes SUVs to an SUV company that also makes cars? Currently, there are six in the North American pipeline: the Nexo fuel-cell crossover, the Tuscon, the Santa Fe, the Kona, the Kona EV and the Santa Fe XL. Palisade is seven and Smith said one more is coming. Its styling is bold, with a massive front fascia, huge vertical daytime running lights and a gaping grille. It’s also pushed out to the corners, for a rather boxy but not unattractive shape. It embodies a break with tradition, as well. Lead designer SangYup Lee said that unlike some carmakers who try to make each model look like a smaller or larger version of its sibling, Hyundai is aiming to share design cues but not copy them. So while the Santa Fe, for instance, has daytime running lights that sit like eyebrows above and separate from the headlights, the Palisade’s begin in the eyebrow position but carry through down to the headlights. The Palisade also aims to take a chunk out of the premium large SUV segment, with premium touches including power reclining third row seats, quilted leather upholstery and a premium feel to the dash, centre console and related components. A new snow mode adjusts torque split from front to back and side-to-side to maximize whatever traction may be available. As well, where once there was a competition to provide as many cupholders as possible, today’s rivalry seems to be about how many USB charging ports you can provide. They’re everywhere: on the console, on the front seat back (for middle-row passengers) and it the third row. Palisade also features eight driver safety features, including lane guidance, forward collision avoidance with pedestrian detection, blind spot detection, rear cross-traffic alert, auto high-beam, driver attention alert, safe exit and smart cruise. That BlueLink system provides for remote starting with climate control, car finder, remote unlock and lock and diagnostic tools. The system comes free for five years and uses the driver’s smartphone as an interface. The 2020 Hyundai Palisade will be available in summer of 2019 in Hyundai dealers across Canada. There’s a Freddy Cannon joke in here somewhere, I just can’t think of one. Pricing hasn’t been announced. Stay tuned.